Hera and Akut [Herakut] saved my life. They have managed to become my only exit out of my brutally mundane environment, spotty with pseudo-innovative chumps with tired techniques mistaken for creativity. Honestly, I don’t even want to leave my house for fear I’ll run into some of these half-assed stencils and installations that are out right now. I want to see something that’ll fxcking make my head spin. I want to see something that I CAN’T do. Give me some Herakut, dammit. 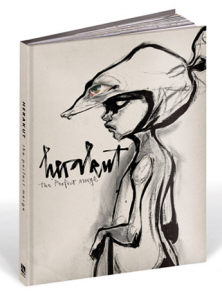 Lucky for me and the rest of the restless, the duo has come out with a hearty-sized book this month, so appropriately titled The Perfect Merge, filled with images capable of changing your entire perspective on the hybrid of street and fine art. I refuse to say anything more about their work, simply because I feel the entire process and product speaks for itself. Really, no words would be able to do them justice. Cue: video. Don’t forget to pick up a copy (I see that tax refund check), but be sure you’re prepared for some serious brilliance.